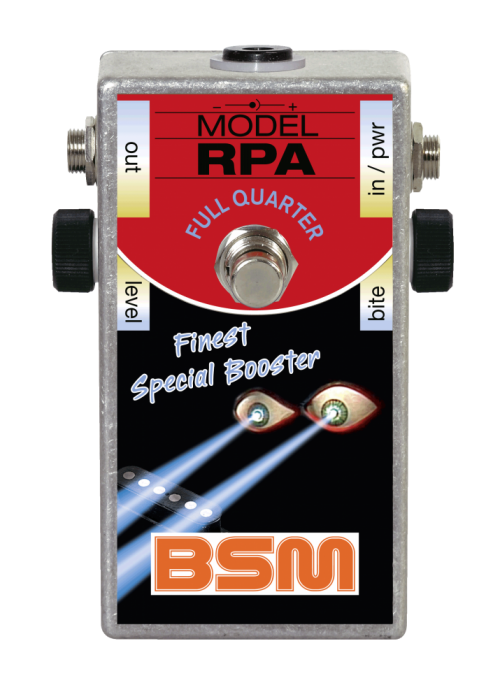 There is a new special preamp/booster pedal: the “RPA Full Quarter”, developed for fat single coil pickups like the "Schecter F500", the OBL 450XL (or similar) double blade humbuckers that Ritchie Blackmore used in the 1980 and beginning of the 90s. The pedal ensures no muddy or dull sound with powerful pickups like these in the operation of conventional amps to achieve a dynamic transparent sound. It can also handle the additional inductivity (which tends to cause a dull sound as well) of a dummy coil. It can of course also be used with the Seymour Duncan SSL4 Quarter Pounds (tapped or untapped versions), which were used in the Blackmore signature Strats from Japan and Mexico and were similar of the Schecters. This pedal is THE solution for fat pickups like the above or e.g. the DiMarzio FS-1 and lots of others. As a soulmate for the RPA, you can use any mild sounding amp with a good master control function. The RPA Full Quarter Booster is inserted between guitar and amplifier, not into the FX loop. The magical tone is achieved by the interaction between guitar pickup, booster and amplifier. The unit is powered by a 9V battery with a current consumption of approx. 400 uA. The maximum output voltage when the strings are struck really hard is 7V max. Because of the external DC jack, you can power the RPA Full Quarter with 9 volts. Schecter, OBL, Seymour Duncan, Quarter Pound, DiMarzio, FS-1 and Strat are registered trademarks, which BSM is not affiliated with! If you have any questions concerning our products, especially the BSM RPA Full Quarter Booster, our tech-head and mastermind Mr. Bernd C. Meiser would be happy to talk to you. So don't hestitate any longer and send him an email to info@treblebooster.net or use the contact form to contact him.